Please note that the content of this book primarily consists of articles available from Wikipedia or other free sources online. Dylan J. Neal (born October 8, 1969) is a Canadian actor who has appeared in a large number of television shows and in feature films. He is best known for role as Dylan Shaw on The Bold and The Beautiful from 1994 to 1997 and his supporting role as Pacey Witter's older brother, Doug on the American television drama Dawson's Creek. Other significant roles include that of Mike Celluci in Lifetime's series Blood Ties and the role of Aaron Jacobs in Sabrina, the Teenage Witch. 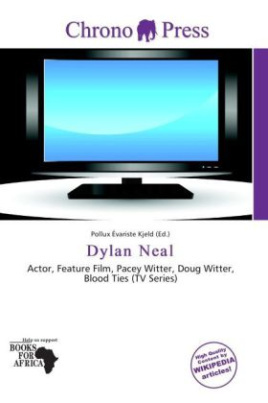 Additionally, Neal took on the role of Corey in Aaron Spelling's short lived drama, Pacific Palisades. His most recent work was in the film The Traveler (2010 film) as detective Alexander Black.